The US Army — the most modern fighting force in the world — relies on the latest technology in smart bombs, fighter planes, and smart ships. But when fighting in the battlefield, all the technology in the world can be reduced to two soldiers locked in hand-to-hand combat, where survival is the winning prize. The most technologically advanced fighting force in the world relies on the best and most effective hand-to-hand fighting techniques ever developed. 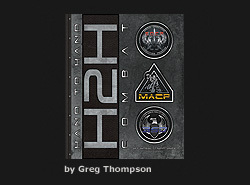 In H2H Combat, Soldiers Edition, The creator of SOCP (Special Operations Combatives Program). Greg Thompson demonstrates the same combat and self-defense techniques he teaches to the Special Forces and Army troops. In H2H Combat, Soldiers Edition, you will learn modern clinching, effective striking, basic weapon takeaway, knife defense, and grappling techniques that may someday save your life. This book is not only a must for the young recruit as well as the battle hardened expert, but also for anyone that is concerned about personal protection in this modern and aggressive world. * To purchase, click on the Case Order button below and complete the form with your personal information and request the number of cases you wish to purchase. * To purchase online, click the buy now button below.